Q: The US Department of Justice indicted two Chinese nationals on charges including conspiracy to commit computer intrusions, conspiracy to commit wire fraud, and aggravated identity theft, accusing China of undermining the US cyber-security for a long time. What is your comment? A: In response to the erroneous words and actions made by the US side on the cyber-security issue, China has made clear its stern position at the earliest time possible. The US side fabricated stories out of nothing and made unwarranted accusations against China on the cyber-security issue. It "indicted" two Chinese nationals on the grounds of the so-called "cyber stealing". This move, with its egregious nature, has gravely violated the basic norms governing international relations and seriously damaged China-US cooperation. The Chinese side strongly opposes this and has lodged stern representations with the US side. The Chinese government holds a consistent and clear position on the cyber-security issue. China is a staunch defender of cyber-security and has been firmly opposing and cracking down on all forms of cyber espionage. The Chinese government has never participated in or supported others in stealing commercial secrets in any form. It has long been an open secret that relevant departments in the US have been engaging in large-scale and organized cyber stealing, spying and surveillance activities on foreign governments, enterprises and individuals. The US side making unwarranted criticisms of China in the name of so-called "cyber stealing" is blaming others while oneself is to be blamed, and this is self-deception. China absolutely cannot accept this. 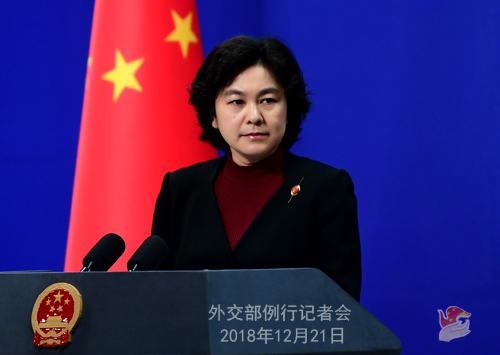 We urge the US side to immediately correct its wrongdoings, stop defaming and discrediting China on the cyber-security issue, and withdraw its so-called indictment against the Chinese nationals so as to avoid seriously damaging bilateral relations and cooperation in relevant fields. China will take necessary measures to resolutely safeguard its cyber-security and interests. The US side was used to citing various anonymous sources or numbers that are "seemingly real" to accuse China of various things, which were later all proven wrong. This is nothing new. Not long ago, the Bloomberg Businessweek reported that Chinese hackers implanted microchips in the products of some of the US companies, including Apple and Amazon, to steal and channel out information. But Apple, Amazon and Supermicro all denied this story as soon as they could. Apple demanded a retraction of the report. Amazon said that there were many inaccuracies in the report, and no tampered hardware or problems arising from malware have been found. Supermicro said that the third-party's report did not identify any issues with suspicious chips or malware after a full review. We heard that Supermicro still reserves its right to pursue legal liabilities or take legal actions. Even the US Department of Homeland Security has publicly acknowledged that there was no evidence to prove that China has done such things. This time, the US side issued a so-called "indictment" on two Chinese people on the grounds of so-called "cyber-stealing", accusing them of infiltrating into the IBM and HP Enterprise. But I saw reports saying that the IBM has clarified in a statement saying that there is no evidence that sensitive IBM or client data have been compromised by China. The US is the world's No.1 superpower. But it is filled with arrogance and selfishness. It has been leaving no stones unturned to suppress other countries' legitimate development rights because of its narrow-mindedness and zero-sum mindset in order to preserve its hegemony. It has gone so far to fabricate stories out of nothing. This is not what a superpower is supposed to do. A US like this augurs badly for world peace and development. In a long-term view, it is not helping its own interests. Whether it is on cyber-security issue or on the so-called freedom of navigation that has been brought up before, some people in the US are so used to hurling groundless accusations at China and pinning various labels on us. Maybe they are convinced that "lies repeated a thousand times will become truth". But I want to tell them that lies will always be lies even if repeated ten thousand times. In this world, justice will always prevail over evil. Justice may be late to come, but it will come in the end. Q: Sources familiar with the situation say that the detained Canadian citizen Michael Kovrig is being questioned throughout the day. He is not allowed to see a lawyer and is only allowed one consular visit a month by the Canadian diplomats. I knows that the Chinese government says that his lawful and legitimate rights are being protected. Does the government consider such treatment is indeed protecting his lawful rights? A: I was wondering how you learned about this. Is that true? The Chinese side has ensured Michael Kovrig's all legal interests, accorded him with humanitarian treatment, and provided necessary assistance to the Canadian side for its performance of consular duties in accordance with law. As to his specific situation, I would refer you to the relevant competent authority. You are quite interested in how he was treated, but I was wondering if you ever cared about the treatment as well as the interests and rights of the Chinese citizen when she was illegally detained by the Canadian side at the request of the US? Q: When taking questions on China-Russia ties at the annual press conference, Russian President Vladimir Putin spoke positively of the remarkable achievements of China's reform and opening-up over the past four decades and highly praised the Russia-China relations, saying that the cooperation between Russia and China in the international arena has become a factor of stability and predictability for the development of the international relations. What's your reaction? A: We highly appreciate President Putin's positive remarks on China's achievements through reform and opening-up, which demonstrates the high political mutual trust and the high-standard comprehensive strategic partnership of coordination between China and Russia. The world today is far from tranquil, with increasing uncertainties and instabilities. In the face of profound and complex changes in the international landscape, the China-Russia relations have demonstrated rock-firm stability and injected many stabilizing factors into the complex and unstable world. The China-Russia strategic coordination has become a mainstay in upholding and promoting world security and stability. President Xi Jinping and President Putin have deep friendship. They have met for four times in this year and exchanged visits to steer and guide the bilateral relations. The practical cooperation in such fields as investment and energy between the two sides have continued to deepen and achieved a host of positive outcomes. In particular, the cooperation on strategic projects in relevant areas has been advanced steadily, which demonstrates strong inherent driving forces and broad development prospect. The year of China-Russia sub-national cooperation and exchanges has been successfully held with close cultural and people-to-people exchanges. Specially, the two sides have maintained close strategic coordination in international affairs, advanced the political settlement process of hot-spot issues, championed multilateralism, opposed unilateralist acts and played a strategic stabilizing role in promoting world peace, stability, fairness and justice. As the two countries will celebrate the 70th anniversary of the establishment of diplomatic ties between China and Russia next year, we stand ready to work together under the strategic guidance of the two heads of state to further consolidate political mutual trust, strengthen strategic coordination, step up all-round cooperation across the board so as to ensure that the comprehensive strategic partnership of coordination between China and Russia will achieve more fruitful outcomes, bring more benefits to the two peoples and make greater contributions to promoting global and regional peace, stability, security and prosperity. Q: What is China's take on the US plans to withdraw troops from Syria and Afghanistan? Does it think that it will worsen the instability in these areas and what will China do? Some experts have said that they worry the US administration's real goal in reducing its commitments to the Middle East and Afghanistan is actually to focus its attention on the threat from China. What's your comment? A: China's positions on the Syria issue and the Afghanistan issue remain consistent. At present, the Syria issue is at a new crucial stage. The momentum for its political settlement is gathering. China maintains that the Syria issue should be resolved politically. The sovereignty, independence and territorial integrity of Syria be respected, and the future of Syria be determined independently by the Syrian people. We hope that all relevant parties could work together to create favorable conditions for an early launch of an inclusive Syrian-owned and Syrian-led political process so that a proper settlement for the Syria issue could be reached at an early date. This serves the common interests of all members of the international community. Afghanistan is a friendly neighbor of China. China consistently supports Afghanistan's peace and reconciliation process owned and guided by the Afghan people. China will continue to make contributions to and work for the peace and reconciliation process of Afghanistan so that Afghan people could enjoy peace, security, stability and development at an early date. Q: US lawmaker Marco Rubio and others said in a statement that they are deeply concerned by the escalating crackdown against Christians' religious freedom in China. 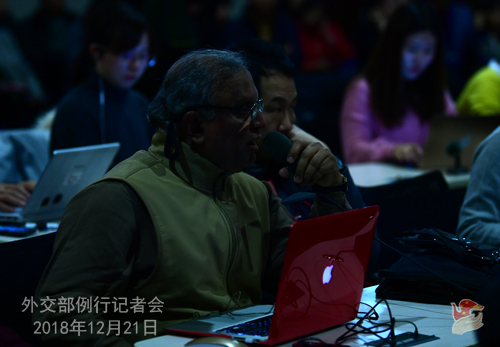 It also said that Xinjiang Muslims are being detained and forced into labor. China "sinicizing" all religions are having a devastating toll. What is your comment? A: Such a statement by US lawmaker Rubio is full of nonsense and is not worth refuting, because it is just another proof of the habitual arrogance, ignorance and egotism of some American individuals. I just want to ask Senator Rubio two questions. First, does he know how many religions and religious believers China has? I wonder if he knows that China at the moment has five major religions, namely Buddhism, Taoism, Islam, Catholicism and Protestantism, with nearly 200 million believers, about 144,000 places of worship registered for religious activities in China, and more than 380,000 clerical personnel. Chinese citizens are fully entitled to freedom of religious belief in accordance with the law. Second, has he ever been to China or Xinjiang in particular? Does he understand the role and importance of the Xinjiang vocational training programs in combating terrorism and eradicating extremism? He seems confused about the fact that de-extremization and freedom of religious belief are two totally different things! Does he know that the local Chinese government is taking these preventive counter-terrorism and de-extremization measures to protect more people from being devoured by terrorism and extremism and to ensure the full and normal access to freedom of religious belief for more ordinary people! Would he like to do one real deed to take in all those affected by the extremist and terrorist forces and let them enjoy "absolute freedom" in the US? Q: Can you comment on James Mattis' resigning as the US Defense Secretary? A: We have no comment on this matter as it is the domestic affair of the US. Q: Will the matter involving the accusations against the so-called hackers have any impact at all on the China-US trade negotiations going on right now? 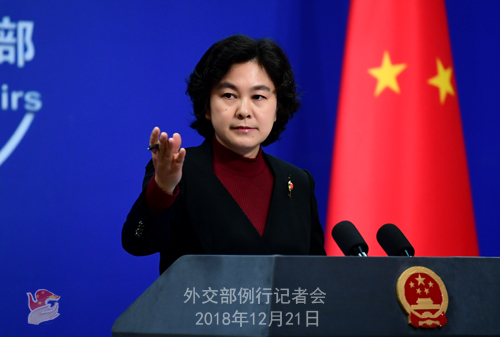 A: I just said that we urge the US side to immediately correct its wrongdoings, stop defaming and discrediting China on the cyber-security issue, and withdraw its so-called charges against the Chinese nationals so as to avoid seriously damaging bilateral relations and bilateral cooperation in relevant fields. Q: Yesterday, someone cited the New York Times story on the China-Pakistan Economic Corridor (CPEC) where China and Pakistan plan to build some military equipment, including new fighter jets. Do you have any reaction to that? A: This question was raised yesterday. I checked on it after the press conference. According to my information, the relevant report is not true. The CPEC is an important cooperation framework with a view to the long-term cooperation and development between China and Pakistan in various fields, aiming to promote the economic and social development and enhance the livelihood of relevant regions. On December 20, the Joint Coordination Committee of the CPEC held its eighth meeting in Beijing. Going forward, the two sides will continue to implement the consensus reached by the leaders of the two countries and consolidate the early harvest projects of the CPEC, in particular expanding the CPEC to such fields as the building of industrial parks and social livelihood. Q: According to a report by the Voice of America (VOA), the World Bank warned about the possible severe consequences of the China-US trade war on December 20, advising China to intensify its efforts to correct unfair trade practices. What's your comment? A: The report of the Voice of America is not accurate. We have also seen the report released by the World Bank, which pointed out that trade tensions and rising uncertainties could have an impact on global trade and income. The report positively affirmed the Chinese government's policy measures to address external risks, promote economic growth and boost investor's confidence, yet made no mention of "advising China to intensify its efforts to correct unfair trade practices". As everyone knows, China has always supported open and free trade and firmly upheld the multilateral trading system. China doesn't want a trade war with any country. It is very clear what has led to and who is to blame for the current situation, and the international community also has a fair judgment on that. The heads of state of China and the United States successfully met on the sidelines of the G20 summit in Buenos Aires. The economic and trade teams of both sides are working hard to implement the important consensus reached by the two heads of state and advance consultations on economic and trade issues. In his important speech at the gathering in celebration of the 40th anniversary of the reform and opening-up, General Secretary Xi Jinping clearly stated that China will unswervingly deepen reforms in an all-round way, expand opening up, and continue to move forward reform and opening-up in the new era. 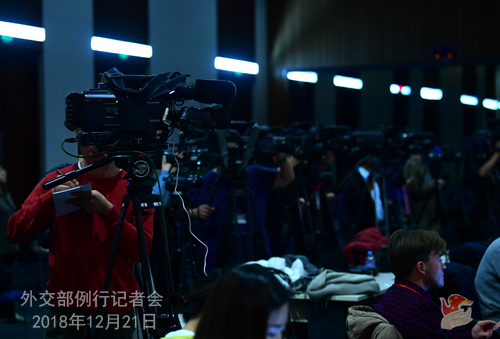 The international community has responded positively to General Secretary Xi Jinping's important speech and is full of confidence in China's investment environment and economic prospects. Q: There was a report that the Vietnamese military has reportedly found a Chinese torpedo in relevant waters. Some thought that it may be strayed or something like this. Do you have more details? A: I saw a brief news release issued by the Chinese Defense Ministry saying that they noted the news that "a Vietnamese fisherman in Phu Yen caught a Chinese torpedo". In early December, the Chinese navy lost a torpedo near the waters east of the Hainan Island while conducting drills, and it could have drifted to waters near Vietnam by currents. The torpedo is just a regular training dummy and not aimed at any target.